With positive signs that the global economy is at last showing signs of improvement, many companies are now scheduling overseas trips again, which means sending their staff back on the road and the Thai capital is again flooded with businessmen. But with a close eye on the bottom line costs, travel budgets are tight and gone are the chances of grabbing a few extra nights in Bangkok to fit in a couple of rounds of golf with the local VP or sales agents! In Thailand golf and business however are still a great way of clinching that business deal or renewing contacts. So with this in mind I was curious to find out exactly what were the options of conducting a bit of social business around golf while travelling in Bangkok on a tight schedule. Firstly floodlit golf means a different slant on the business dinner. Certainly it is a known fact that the Asian businessmen in Thailand love to fit in 9 or 18 holes at night before grabbing the overnight plane back home. Just head to the Summit Windmill Golf Club on any weekday at 5PM! The Nick Faldo designed courses is conveniently around 20 minutes from both Bangkok centre and the new Bangkok International Airport. Golf mad businessmen can be found on the course while the locker rooms are stuffed with carry-ons and garment bags for their flights home.Night golf rates are very low at around 30 USD for 18 holes. Staying in Bangkok, the Grand Millennium hotel in Sukhumvit has its own putting and pitching area, even with a real bunker! This short game practice area is on the rooftop with two outdoor practice bays and a putting green. How about a 5 USD putting competition anyone? 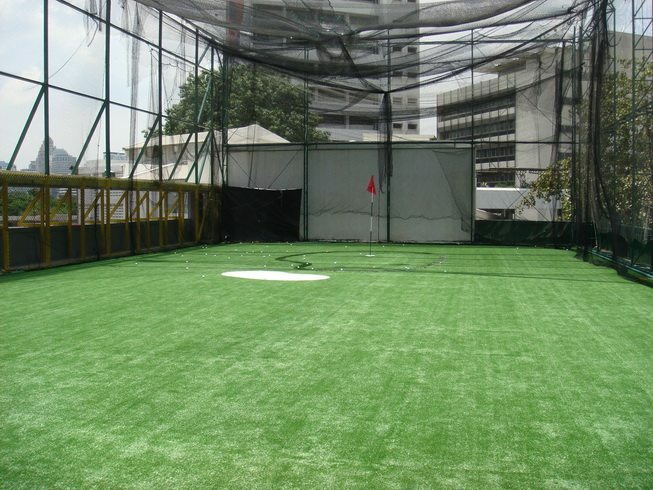 The rooftop of the Dusit Thai Bangkok is adorned with a 50 meter driving range that accommodates 20 golfers. Here you cannot only tune your golf swing before heading out for the day, but you can bring back your new colleagues after your Bangkok business meeting, all hit balls together, and order some fancy food and drinks well into the night. Now that sounds like fun! Hopefully, these few tips will make that next Bangkok business trip just a bit more “productive”! No need to watch TV in your room or worry about those bloating expense reports ever again!